Ruthiebear (Titusville, NJ, United States) on 28 February 2016 in Landscape & Rural and Portfolio. It is not comfortable to sit on now. Une belle couche de neige, ces troncs recouvert quelle vue et captage superbe. joli moment ! ***** froid mais beau ! Better to wait for better weather. But it's a nice capture. Superbe! Bise et bon dimanche tout doux! Beautiful winter photo with a surprising composition. It looks chilly. Wonderful capture. What a great show ... snow and a place to rest ... but I need a good blanket! HUGS dear friend! No riverside sitting today! A pretty snowy scene. Please,after you on the chair.Yes I insist. A fabulous image! I love the snow and the lone chair. Soon it will be spring and be ready for someone to sit in it! 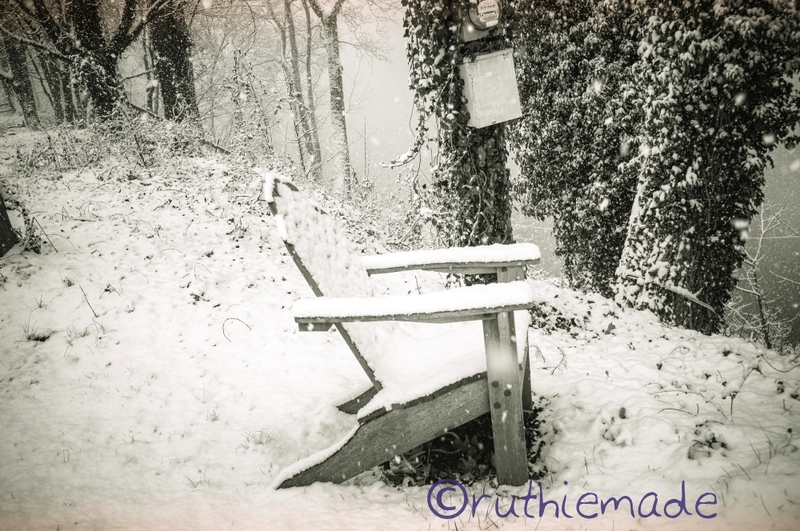 A good place to sit and watch the snow fall. Oh, yes, it is definitely snowy. Great shot. I like the chair, but the clipboard thingy handing from the tree is a puzzling element. @Harry: It is not a clipboard but an electric meter box. Le coussin est un peu trop froid, mais pour les beaux jours, l'endroit est idéal !